Strapped to your body! Don’t panic. This is not as bad as it sounds. It does take some getting used to, but there are lots of running water bottle options. We will discuss them in today’s post. Provides access to water or fluid-based fuel while you run. It all comes down to preference. There are backpack style “bladders”, like Camelbaks. Another option is a running water bottle. The bottles are typically secured by handheld or waist belt holsters. The bottles range in size from one large bottle (about 24 ounces) to several small bottles (6 to 8 ounces each). I know runners who have successfully used each of these options. I prefer handheld running water bottles. Given that I chafe very easily, I had some trouble with hydration belt styles (though other runners I know have not had any problems). I’ve never tried a back pack style, but I have similar concerns. 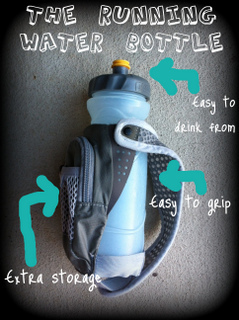 Another challenge with hydration belts – the bottles can be hard to pull out and put back in the holster. Imagine trying to get into a squat position after 16 of 18 miles of running, to pick up your dropped bottle. Personally, I like to have them in my hands! Is your budget super tight? You could try regular sport bottles or energy drink bottles. I’ve done it, but don’t recommend it! Your hand might get quite tired! A final option is to run in an area where water and sport drinks are readily available at frequent intervals (less than 1 mile apart). I have found that most towns have a trail or loop that’s frequented by distance athletes. These are often stocked with fresh fluids or water fountains. Just make sure that you are able to drink whenever you are thirsty. Note: I’ll cover the logistics of how to mix and use fuel and fluids while running, in a later post. 48 oz. 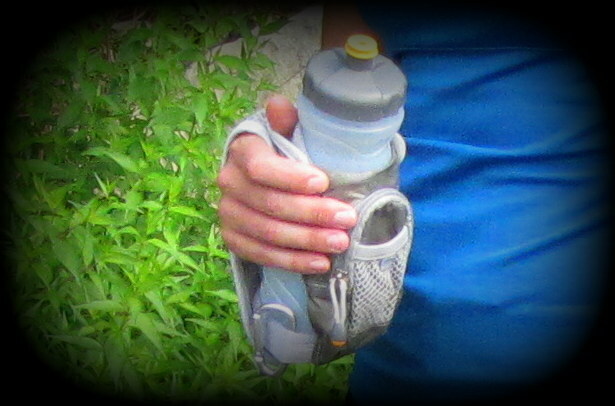 total capacity – Aim for separate containers (sport drink and water) equivalent to 2-3 hours’ worth of hydration. This should cover most of your training runs.Storage space (for keys, ID, energy gels, phone). 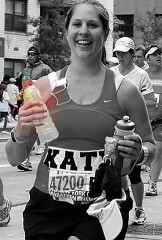 During my first marathon, I used an old Gatorade bottle as one my running water bottles. I don’t recommend it, but it certainly was a cheap solution! What other inventive solutions have you heard of for hydration? Leave a comment, so we can all benefit from it! Roberts, Bill, John Cianca, and Joseph Chorley. “Optimal Hydration: Establishing a Hydration Plan for Marathons.” American Medical Athletic Association: 1-2. American Road Race Medical Society. Web. 24 Apr. 2012. Noakes, Tim. “IMMDA Advisory Statement on Guidelines for Fluid Replacement During Marathon Training.” New Studies in Athletics: The IAAF Technical Quarterly 17.1 (2002): 17-24. Print. Rapoport, B.I. “Endurance Calculator.” Endurance Calculator. PLoS Computational Biology, Oct. 2010. Web. 25 Apr. 2012. <http://endurancecalculator.com/>. Fitzgerald, Matt. “Hydration and Nutrition During Running.” Runner’s World Performance Nutrition for Runners: How to Fuel Your Body for Stronger Workouts, Faster Recovery, and Your Best Race times Ever. [Emmaus, PA]: Rodale, 2006. 97-120. Print. Your body needs fluids and fuel to complete a marathon. These also help ward off “the wall” (as we talked about in a previous post). Now most peoples’ running energy (glycogen) store is depleted after about two hours of running. Running out of “gas in your tank” obviously compromises your ability to keep running. Furthermore, your body sweats out fluids faster than you are physically capable of drinking them in while running. This is where it gets dangerous. Both dehydration and over hydration are serious conditions. Key takeaway: You must refuel your body with ENERGY and FLUIDS during runs. Now for my interpretation of the complicated science (in layman’s terms)…you sweat out more than water. You sweat out minerals (or more specifically, electrolytes). Those electrolytes include Sodium, Chloride, Potassium and Magnesium. Maintaining a balanced ratio of these electrolytes and fluids helps your body properly function. If you take in too much fluid and not enough electrolytes, your body becomes overhydrated. Over hydration is very dangerous. Key takeaway: You must maintain an acceptable balance of fluids and minerals. Do not OVER HYDRATE. How much fluid you need in order to maintain hydration, but not overhydrate, is unique you and how much you sweat. The experts recommend a broad guideline of drinking when you are thirsty, but NO MORE than 24 ounces (710 mL) of water or energy drink per hour. Some runners go as far as taking the “sweat rate test“, weighing themselves pre/post run to estimate fluid loss. I don’t go that far, but I do pay close attention to the quantity of fluids I take in. Key takeaway: Follow the recommended intake guidelines (14 – 24 oz. or 710 mL per hour) to maintain the proper hydration balance (ratio of electrolytes to fluids). You must have ACCESS to and MONITOR the AMOUNT of fluids you consume while running. And what about fuel? Fuel is no less complex! Most runners can take in around 60g – 80g carbohydrates per hour (whereas they are burning up to 200g per hour). The ideal fuel contains easily absorbed carbohydrates (Sucrose, Glucose, Maltodextrin or a mixture of these). Your fuel should also be quickly absorbable. Studies show that fastest absorption happens when carbohydrates are 2%-8% of the ingredients. Anything containing a higher amount of electrolytes (Sodium, Chloride, Potassium and Magnesium) is a bonus, as most energy drinks and carbohydrate gels contain very little. Another nice to have is protein/amino acids, which can help increase endurance and minimize muscle damage. Key takeaway: You MUST refuel your body with easily and quickly absorbed carbohydrates (60g-80g per hour) during long runs. If your fuel also has protein and electrolytes, that’s even better. Long answer to a short question. Ideally, you would run with one source of fuel that addresses all of the above takeaways. Unfortunately, there is no energy drink or running energy source does it all in terms of maintaining hydration balance and fueling your body. I use a combination of water, energy drink and carbohydrate gels. It hasn’t given me any trouble, but to be honest, it doesn’t meet all of the above criteria. I prefer gels for running because they are self-contained and easy to eat (squeeze like toothpaste). They provide carbohydrates, protein and some electrolytes all in an easy to digest, frosting-like little nugget! 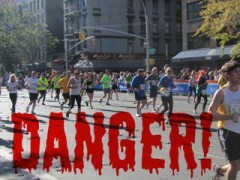 Look for endurance/distance running formulations of energy drinks. These are formulated to have higher amounts of electrolytes and lower concentration of carbohydrates than those in the grocery store. As a result of being formulated for higher concentration of carbohydrates and electrolytes, running energy products may taste stronger than what you are used to. Consider diluting energy drinks a bit or consuming with a sip a water to help get them down. How did I do? I tried to give you the straight scoop without scaring you or overwhelming. But fuel and hydration are more technical and serious aspects of marathon training. If you learn nothing else from this series, PLEASE, remember that maintaining fuel and hydration is crucial. Still have a question about energy for runners? Post it on our Facebook site, and I’ll get you the answer. Amy Jamieson-Petonic, R.D., manager of the Fairview Hospital Wellness Center in Cleveland. Tucker PhD, Ross, and Jonathan Dugas PhD. “The Science of Sport: Sports Drinks, Sweat and Electrolytes.” Sports Drinks, Sweat and Electrolytes. The Science of Sport, 27 Nov. 2007. Web. 28 May 2012. <http://www.sportsscientists.com/2007/11/sports-drinks-sweat-and-electrolytes.html>. Do not run in regular cotton socks! I did not heed this advice. After completing a particularly rainy long run in cotton socks, a whole family of blisters took up residence on my feet. Then a lovely blackened toenail joined the family. Instead of just wearing quality running socks, I attempted to rid myself of these maladies with a pedicure and ending up with a nub and no callouses to pad my feet. Bad idea! A good pair of running socks is your best tool for preventing blisters, calluses and blackened toenails. They wick away moisture (unlike cotton). Your running socks should also help reduce friction between your foot and shoe. 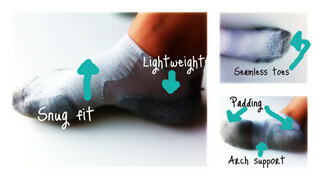 Finally, cushioned socks will help add padding where your foot needs it. Over time, our natural foot padding wears down, and running socks should help replace that. Padding also helps protect against blackened toenails. These occur when your toe repeatedly hits the top of the shoe and doesn’t have enough padding to protect it. Ideally, you should wear running socks for all of your runs. Healthy feet are a big part of pain-free running. But at a minimum, invest in at least one good pair of long run socks. Make sure they are made from wicking material. If the material is anti-bacterial, that is a strong plus as running socks get stinky! Try to find running socks with seamless toes that fit snugly. Any bunching combined with moisture could cause blisters. Another consideration is padding. Running socks should have padding on the heel and from the ball of the foot to the tops of the toes. If your foot padding is worn down, you may want heavier padding for your long run socks. I prefer my long run socks to hit just below the ankles (micro-crew length). Thus far, I can run in them year round. If you are running in shorts or capris and are on a tight budget, you may want to add roll top crew length (mid-calf) running socks during the winter. These will give you a bit more coverage and versatility. Note: Do not get pedicures while training for the marathon (or don’t let them cut your nails or shave your calluses). Repeat after me: I will never run in cotton socks! I will never run in cotton socks! I will never run in cotton socks! Okay, you’ll remember it now. I hope you have enjoyed this series on things every marathoner needs, so far. 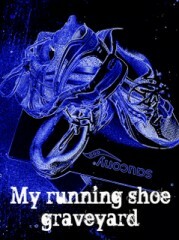 Let me know, by “liking” it on the sharebar to the left of this post and stay tuned for my next post on running shoes.